The explosions of stars, known as supernovae, can be so bright they outshine their host galaxies. They take months or years to fade away, and sometimes, the gaseous remains of the explosion slam into hydrogen-rich gas and temporarily get bright again—but could they remain luminous without any outside interference? "We haven't seen an explosion of this type, at such a late timescale, remain visible unless it had some kind of interaction with hydrogen gas left behind by the star prior to explosion," he said. "But there's no spectral spike of hydrogen in the data—something else was energizing this thing." SN 2012au was already known to be extraordinary—and weird—in many ways. 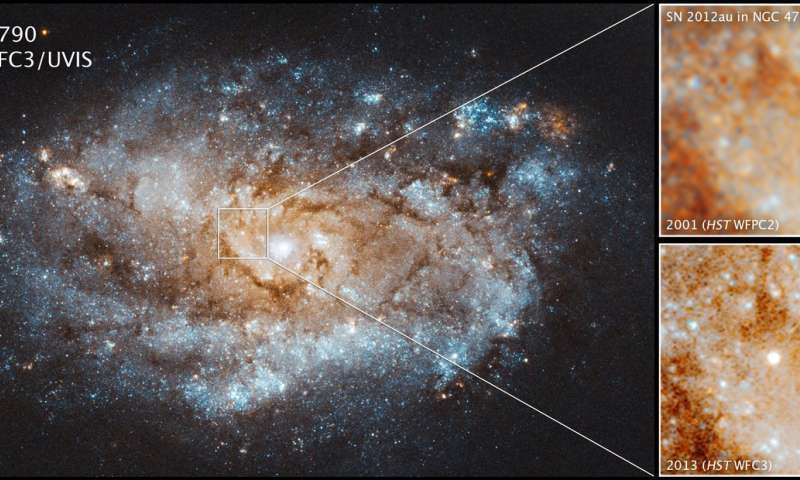 Although the explosion wasn't bright enough to be termed a "superluminous" supernova, it was extremely energetic and long-lasting, and dimmed in a similarly slow light curve. "This is a fundamental process in the universe. We wouldn't be here unless this was happening," Milisavljevic said. "Many of the elements essential to life come from supernova explosions—calcium in our bones, oxygen we breathe, iron in our blood—I think it's crucial for us, as citizens of the universe, to understand this process." Why they think not mentioning it's 236 Mly away is good writing. How was this verified? If wavelength is always increasing; does that imply we have caught the wave, like a surfer; if it is infinite? What if ya start seeing it backward? I doubt it, cause init contains a; darn it. But, you can .. I like that - "Citizens of the Universe". We ARE the Universe and the Universe is us. Could you be more pompous? We live in the universe. How can we be the universe and live in the universe?